The morning of April 6th was bright and sunny. The rain had subsided and it had eventually stopped sometime during the night. Wet traces however remained in the lodge’s porch and the adjoining narrow pathways when I walked out. Varun, KB and Lakhpa were out too, waiting. Sounds of light banter trickled out from the kitchen. The proprietor, a young and jovial sort kept his guests entertained as he quickly rustled up the morning’s breakfast for everyone. The Israeli boys walked out, all strapped up. As it had happened, they had spent the night in the same lodge. Their attempt to cook dinner in their room the night before had been met with resistance by the proprietor. Apparently they had skipped dinner and looked like they were skipping breakfast too. How would they survive I wondered? And what had they eaten last night? Walking on an empty stomach was sheer murder. The whiff of freshly prepared omelettes, momos and noodles from the kitchen drifted out. It got me hungry. Immensely. This was a good sign. Hunger in the mountains had a direct correlation to the body settling in to the altitude. Breakfast would soon be served and we would then head out. I couldn’t wait for both to happen. While the mind was busy thinking of the first meal of the day, the morning sun meantime, felt great as I stretched. The air was cool and crisp like champagne. Mountain air generally is. It would be another fantastic first half. Breathing deep and heavy, and exhaling multiple times was a heady feeling. 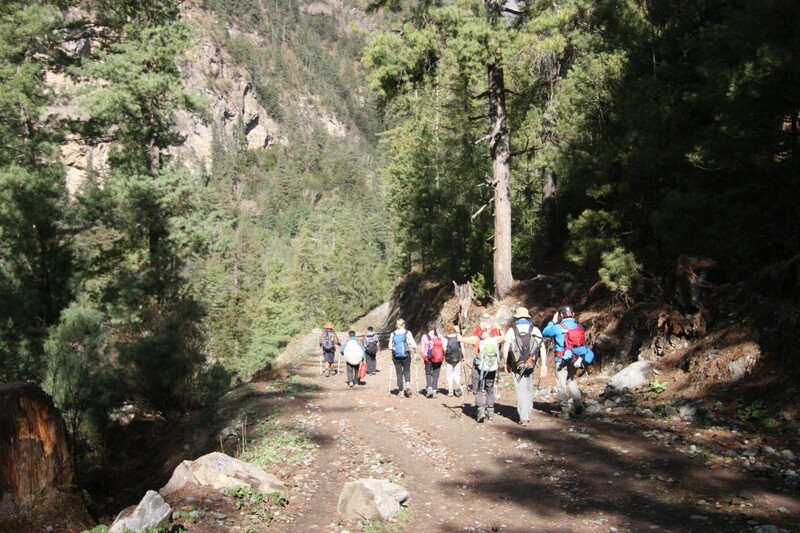 Numerous teams had already commenced their onward journey as I saw them walk past our lodge. Young, old, middle aged. Age was no bar. As my gaze followed them and their footsteps from my right to my left, I looked to the immediate horizon and gasped. In the distance, the white goddess was all resplendent as she towered over the lesser peaks around her. I whipped out the Tokina 12-24 enabled SLR and captured the panorama. Then, followed this up with the Canon 70-300 tele-photo and finally used the iPhone 4S handheld. “What’s the peak KB?”. “Annapurna 2, Debolin Saheb”. Hell, I replied. Already! “And the one next to her would be Lamjung eh?!”. Yes, Saheb, he nodded vigorously. It reminded me of my first sighting of Mt. Everest (8848 mtrs/ 29021 ft) and Mt. Lhotse (8516 mtrs/ 27933 ft) that afternoon when we had reached Tyangboche Monastery (3867 mtrs/ 12684 ft). That was four years ago in 2008 on the Everest trail. It was an incredible sight to see the world’s highest and the 4th highest mountains together. Mighty and tall they were. The clouds kissed their peaks as they moved past. A romantic liaison if there ever was one on this scale. We were mute spectators to this unfolding love affair. And soon that brilliant window was over. Snap. Just like that. Larger cloud formations took over and blocked them from our view. We would have to wait until next morning or afternoon for another sighting. We had giggled, laughed, screamed, pointed out just like small children would, to an attraction. Such emotions and reactions don’t come often and it felt good to be childlike. To be alive. To have seen something for the first time was a feeling that had long been forgotten. I had rediscovered it that afternoon. Such was my state, even when I saw Annapurna 2 (7937 mtrs/ 26033 ft). She was under 8091 mtrs/ 26539 feet, the recorded height of her elder sister, Annapurna 1; the world’s 10th highest mountain. I had called home and shared my excitement with the family on Everest’s first sighting. Now I logged onto Facebook and uploaded the picture to share it with everyone. And in a matter of minutes, the “likes”started popping up. And they never stopped. 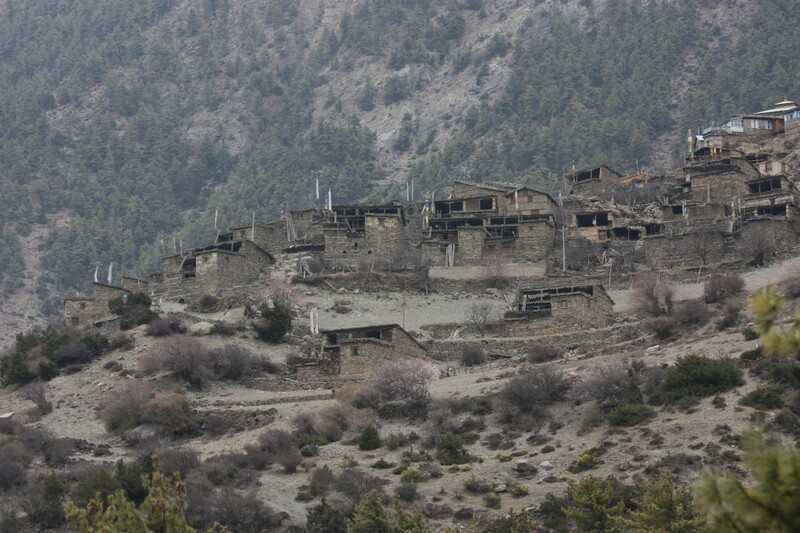 We were headed to the small mountain settlement of Pisang with a population of just 700. Pisang divided into Lower Pisang (3200 mtrs/ 10496 ft) and Upper Pisang (3300 mtrs/ 10824 ft) was split by the river Marsyangdi, which by now had switched banks and was to our left as we walked. The forests of pine and fir continued as did the stretches of shade and sunlight. We had a group of 10 – 12 Germans for company. They were on their way to Lake Tilicho (4949 mtrs/ 16233 ft), one of the highest altitude lakes in the world situated in the Annapurna range of mountains, Manang district, Western Nepal. From what I had read, the lake was a collection of glacier melt from the northern face of Annapurna. From the town of Manang the Germans would deviate westwards towards the last Nepali village of Khangsar, while we continued our journey north facing to Yar Kharkha. The highest lake in the world I knew was in Argentina – the Ojos Del Salada – situated at an altitude of 6390 mtrs/ 20959 ft). That would be some climb I reckoned. It was 10.30 in the morning. We had been walking for 3 hours on the trot. No stops or breaks. We still had to cover a fair distance before we halted for lunch which by our estimate would be around 1.30 in the afternoon. That was another 3 hours. I knew, there wouldn’t be much altitude gain in the day, but the stretch still seemed equally lengthy. 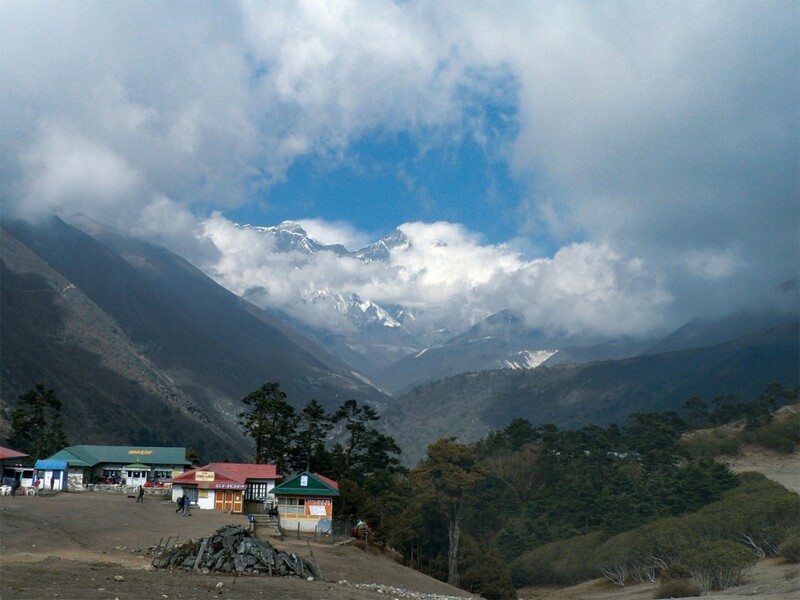 We would ascend just 530 mtrs/ 1738 ft from Chame to Lower Pisang, having completed the bulk of the climb the day before from Dharapani to Chame. 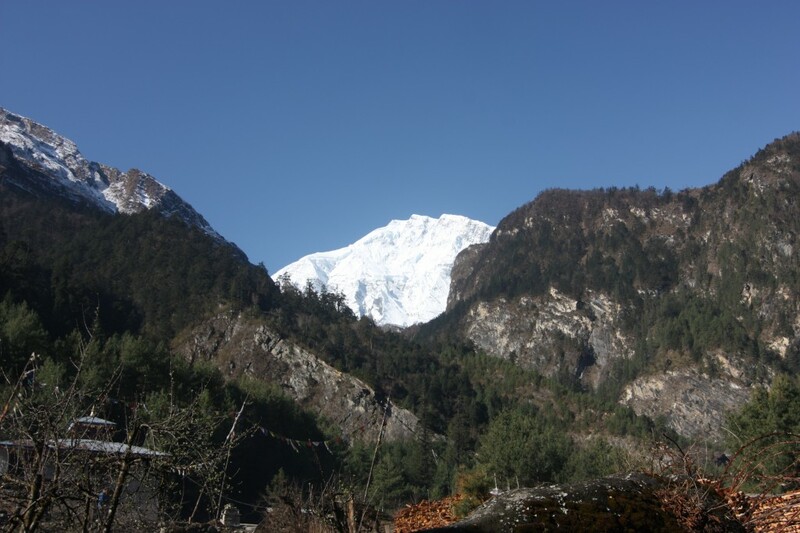 Our next big ascent would be four days hence on April 10th when we would go up Thorung La in the dark of the night. The trail meanwhile continued meandering through large open spaces and steep narrow valleys, through expansive apple orchards and through landslide prone zones full of loose gravel, earth and stone blocks. The sun was stronger now and also beat down on us with all its intensity. It made me blow off a lot of steam as I trudged along. I realised then I was slowing down and the gap between me and the British team ahead was widening. The mind had automatically switched into the step counting mode to keep itself busy. Woah! I halted for a bit, hydrated myself, munched an energy bar and then resumed attacking the trail. We started descending soon, amidst loose rocks and boulders, which slipped from under me with every step, kicking up grey dust as I went along. This was another valley we were entering. The wind kicked in too, cold and fast. And yet, it was steaming hot and bright. The sound of the raging Marsyangdi drowned everything else there was including conversations which until then were in plentiful. 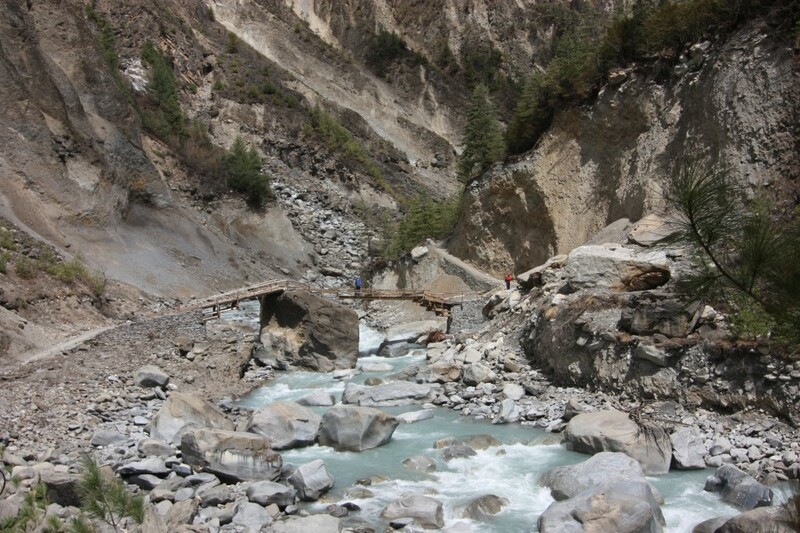 The bridge we crossed was made up of multiple wooden planks laid out horizontally, which we had to carefully step on and hurry across unless we wanted a dip in the cold raging rush beneath. Sharp winding turns awaited us as we moved up gradually. After one such bend, a most stunning view caught my attention forcing me to halt and keep staring. 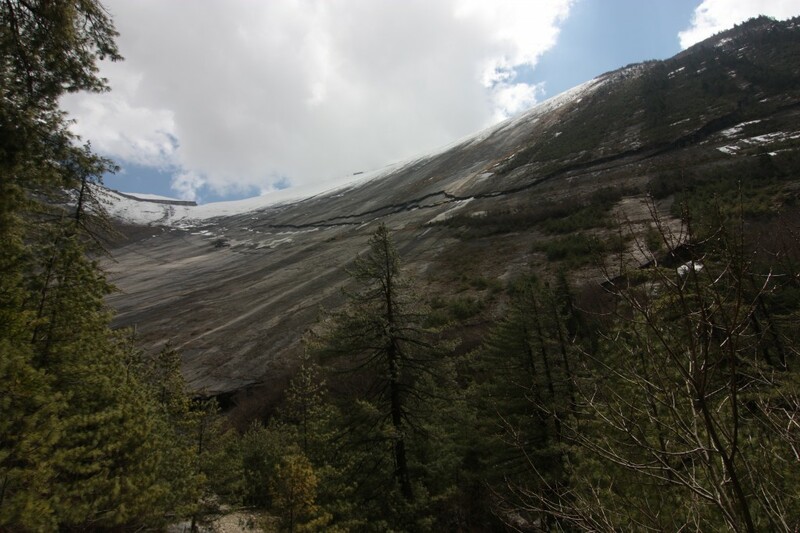 An immense, gigantic, sweeping, soaring, curved rock face rising dramatically from the river bed, almost 1500 mtrs/ 4920 ft into space. This was the Paungda Danda. 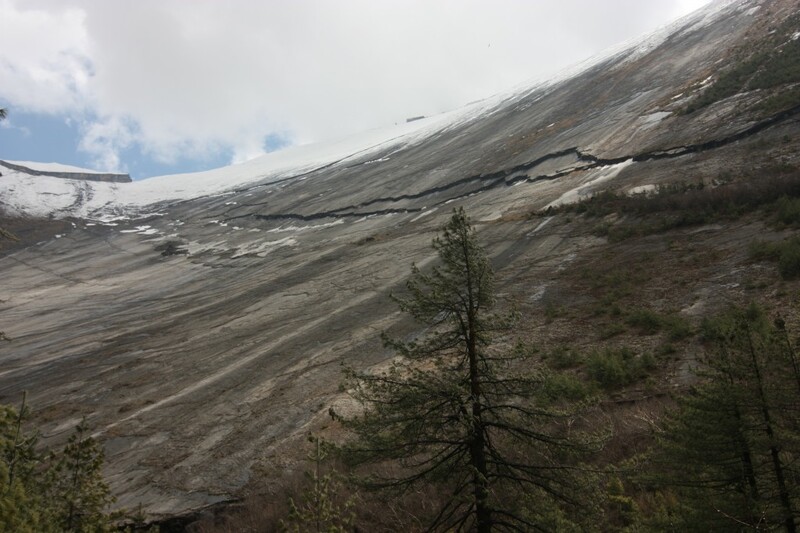 A solid structure characterised by glacial erosion. It was a sloping skating rink, a surface on which you could diagonally walk across it seemed. I remained stationary and tried to figure the angle in which the rock face naturally curved up. But it was difficult, ‘coz after each winding bend when I saw it again, the angle seemed different and awkward. It was marvellous to the eye and yet difficult for the mind to digest and decipher. I continued climbing, having given up. 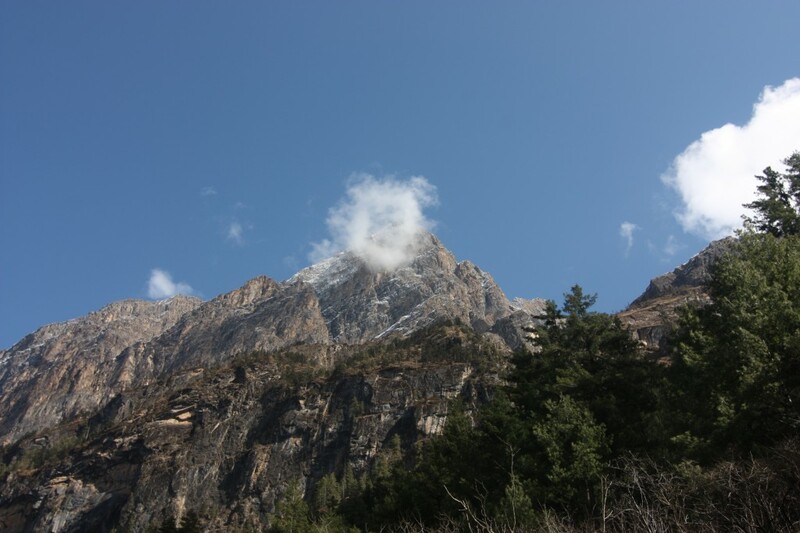 sweeping, soaring, 1500 mtrs from the river bed…. After many such bends in the oppressive heat and grey dust, a wooded, green expanse welcomed us. Tall fir trees, prayer flags strung across, neatly chopped branches piled on the sides, the ground on which you stepped soft to the touch, a shaded environment all around, a warm gentle breeze flowing through, it was pleasantly and wonderfully fuzzy to the senses. We had walked into the realms of the Peaceful Forest. I had flashbacks of the Elven refuge of Rivendell. Where were the elves? Were they waiting, hidden somewhere behind the broad trunks of these magnificent trees, their long bows drawn? Where was Elrond the lord of Imladris? The setting was sheer fantasy. And I was revelling in it. The present setting of modern day climbers and trekkers kept interrupting my visions and flashes. And I alternated between Middle Earth and where I was. These visions of Rivendell stopped abruptly as we exited the forest for before us were the brick and mortar places to eat. I turned back to look at the forest one last time, wistfully. I wouldn’t return this way again. Lunch with the Paungda Danda as a backdrop was a first. We were at 3070 mtrs/ 10070 ft. Just another 130 mtrs/ 425 ft to cover before we reached Lower Pisang. The path ahead was relatively flat and even and opened up to an even wider expanse bordered by thick lines of trees and bushes. The tracks on the pale brown soil were clearly etched and visible. 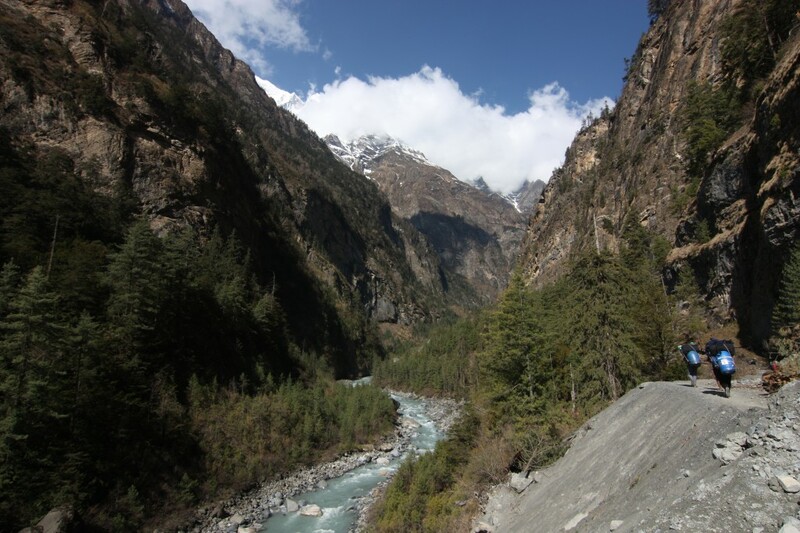 This was mostly due to the heavy human traffic of porters, guides and their clients over many seasons. 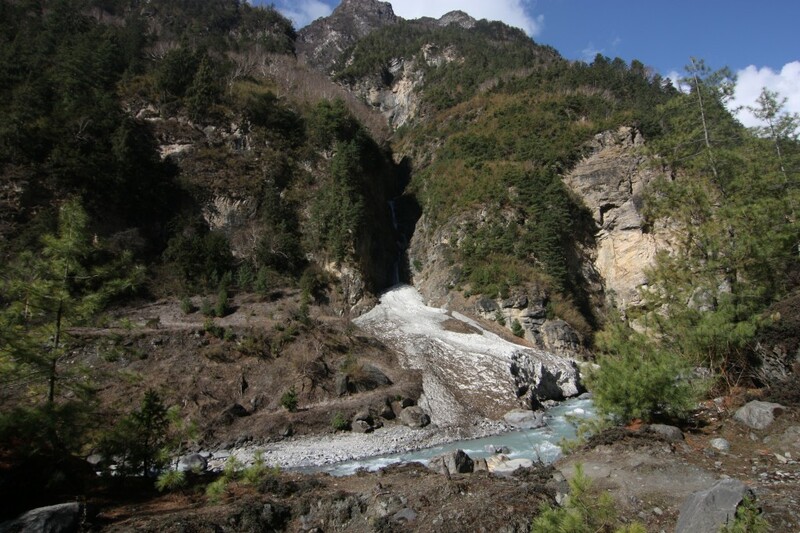 The Annapurna Circuit was after all a very popular trail globally, ever since it had opened up in the late 90s. And it had grown in prominence over the years. In the present day it was positioned as a crackerjack classic for everyone with a love for the outdoors and the mountains. The sheer diversity of terrain the circuit made you cover was unmatchable. 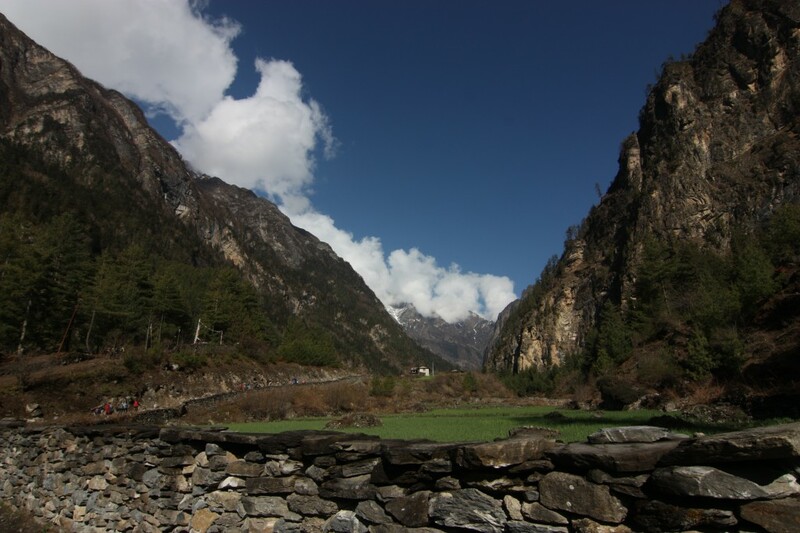 And to add to this, Varun and I were also walking the Annapurna Base Camp trail. What an excellent double header it would turn out to be. As I walked towards Lower Pisang, I came upon a very welcome and a pleasing sight. A family, husband and wife and their 3 daughters, day bags strapped on their backs, walking. The youngest would have been all of 6-7 years old. Holding her mother’s hand she calmly and gently moved on, without any sense and need of urgency. They reminded me of the family Von Trapp from The Sound of Music. Seeing them also amazed me. The life people in the west lived, was so different to the ones we did. The outdoor was an integral part of their existence. It made them naturally tough too. I dreamt of the day Shayon and I would walk together. I would have to wait for another 3 years for that to happen. As I crossed them I smiled and hoped to meet them and the youngest one in person, somewhere soon on the trail. Would she also ascend Thorung La?! The thought made me shudder, but I wouldn’t be surprised if she did. By now I was running across the brown plain. The lunch had been satisfying. Multiple rounds of hot lemon, pop corn and a generous serving of tuna spaghetti helped me release massive doses of energy and propelled me forward. In 45 minutes from the lunch break, we had reached the end of the line, for the day. The grey wooden, worn out gates of Lower Pisang stood silent and death-like. A very morose setting I observed. I walked in purposefully. It seemed like a ghost town, well almost until I saw the lodges which lined both sides of the path. On my right, another 200 mtrs/ 656 ft high above, the hill face was pockmarked. It had deserted and burned down hill settlements. Numerous houses there were. Very strange again. And if that wasn’t enough, soaring and circling the skies above, keeping watch was a raven. In between all this was a temple which was alive, and busy as people kept visiting it. This was Upper Pisang. We were at 10496 feet. This entry was posted in Events, Latest Journey and tagged Annapurna, Annapurna 2, Apple iPhone 4S, Argentina, Canon, Digital SLR, Elves, Everest, High Altitude Lakes, Lhotse, Lower Pisang, Mordor, Paungda Danda, Peaceful Forest, Rivendell, Tokina, Upper Pisang. Bookmark the permalink. Best Wishes for the future expeditions!!! Keep conquering the Altitudes!!! 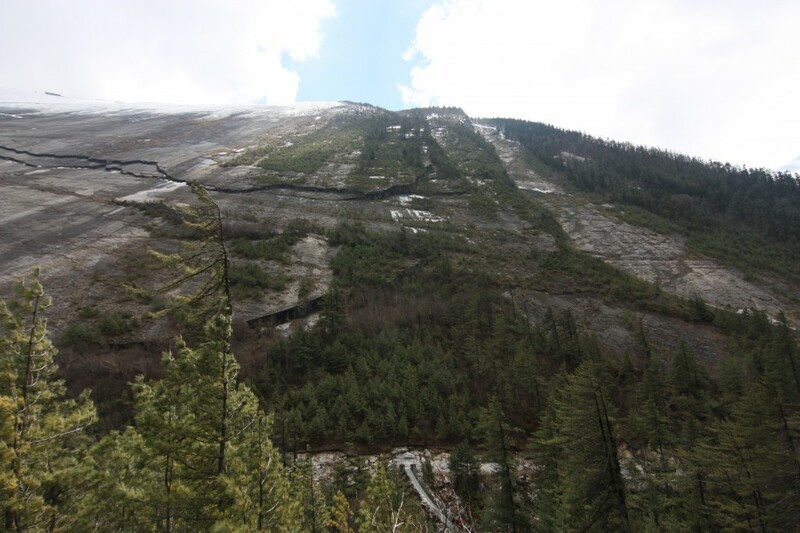 Upper Pisang….you have ended it on a very haunting note. The town really looks lifeless and deserted buried with several untold stories. But the flags on each house seem like an open invitation to share its past….